Spring is a time for transformation and the anticipation for new beginnings. It's also a time for changing weather patterns, from increased rains and melting snow to sudden storms like tornadoes. And just as is true for all types of weather, spring weather brings with it a certain sense of unpredictability; it's a time when a sunny hike can quickly become dangerously cold and thunderstorms can bring unusually high winds, flooding or hail without much warning. It always pays to prepare yourself for weather extremes, particularly during spring and summer when severe weather can hit suddenly. Educating and preparing yourself and your family will dramatically decrease your risks of injury or death in the event that an extreme weather event should occur. Let's talk about some essential items you'll want to add to your preparedness kits this spring, to ensure you're safe from floods, tornadoes and severe storms. Equipping yourself with the right knowledge is at the foundation of proper emergency preparedness. Knowing what to expect, how to react and which tools are appropriate for the job are absolutely crucial to your safety and survival during any disaster, be it weather or otherwise. If you're located in the Van Nuys area, we strongly recommend participating in one of our emergency planning and/or first aid training courses. These classes are ongoing and are designed to help you build or refresh the skills necessary to keep yourself, your family and your pets safe in the event of a natural or man-made disaster. Additionally, check out our Disasters by Region blog to learn, statistically, which natural disasters are most likely to impact you at home or while traveling. Finally, our selection of affordable pocket manuals offer a handy guide for laymen, volunteers, parents and pet owners to basic preparedness and recovery for disasters including floods, earthquakes and school incidents. Knowing your risks and how severe weather can impact you will help you to develop a useful action plan that includes proper in-home preparation, family communication, potential evacuation routes and necessary emergency supplies. A NOAA weather alert radio should be near the top of your list of emergency preparedness item. This versatile tool will help you to stay up to date on all types of severe weather warnings all across the nation. 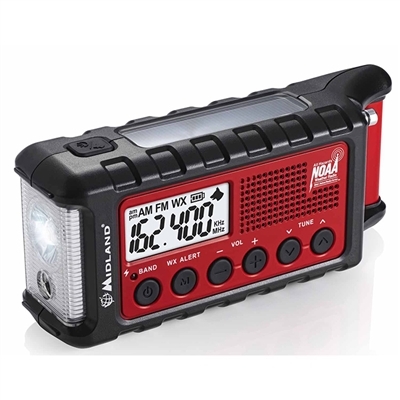 We recommend this radio in addition to keeping severe weather warning apps on your phone since it'll far supersede the capabilities of cellular technology during a long term power outage. 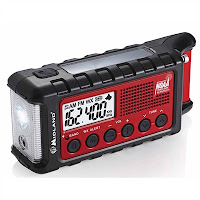 This particular radio includes hand crank as well as solar technology to charge the lithium ion battery when power outlets are disabled or unavailable. The 130-Lumen flashlight can be activated to flash the SOS Morse Code signal, in the event that you are stranded. This radio is a must-have for all homes, homes away from home, recreational camper vehicles and car emergency kits. A flood can be one of the most damaging natural disasters, both to your safety and in the after effects when you're trying to rebuild your life. Flood waters move quickly, picking up tons of debris along the way. When preparing for the possibility of a flood, your priorities should always lie with your safety and that of your family. Remember to heed warnings early and evacuate immediately if prompted. Never take risks around water, during a floor or otherwise. It takes just a few inches of moving water to displace a car or loosen your footing. If water is flowing across roadways, turn around. Don't drown! If you live in an area that's prone to some flooding during heavy rains from unusual spring weather patterns, consider first and foremost adding flood insurance to your home insurance plan. Preparation begins with anticipating all possible potential outcomes of a situation, and having the proper safeguards in place can save you from any future financial hardships that flooding can cause. 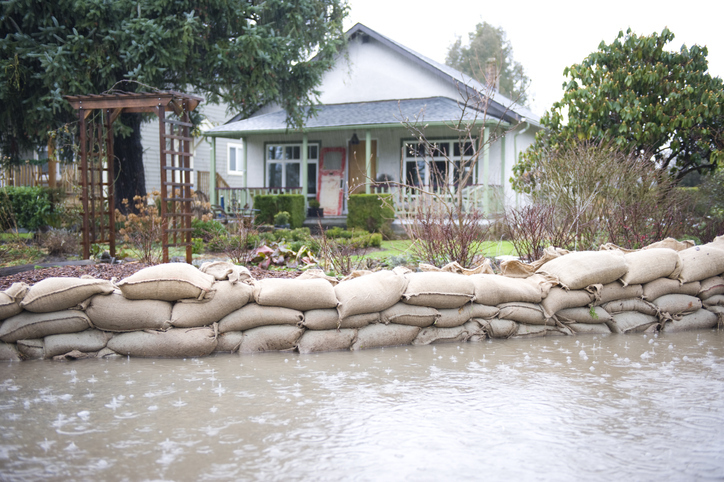 In addition, protect your home with barriers or flood walls, or at the very least with the help of DIY sandbags. 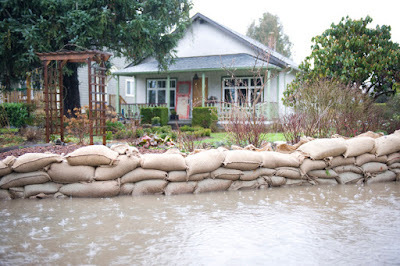 Sandbags are affordable and designed to be long-lasting, whether they are a temporary or permanent fixture in and around your home. It takes about 100 sandbags to create a one-foot high wall that’s 20 feet long, so plan accordingly. Stay on alert during using NOAA or a cellphone app as your resource; if warnings are issued, heed them. If severe weather, such as large influxes in rain, impacts your city's water safety and you're not able to boil water due to power outages, you'll need to rely on your emergency water stores to get you through the day or days ahead. Don't wait until an emergency is declared to stock up on water; this is your most precious resource, and a water shortage can quickly devolve into mayhem. barrels or plastic bottles with clean water from the tap while it's still available. Make an airtight drinking water barrel an essential item in your home; adding water preserver will allow you to store your emergency water for up to five years. Keeping individually sealed water pouches handy, whether you're at home or away, will give you the peace of mind you need when water stores are limited. 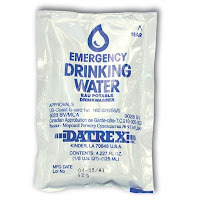 Adding water pouches to your go-bag is a quick, easy and affordable way to take preventive life-saving measures. Use your drinking water wisely. Never use drinking water to wash, flush the toilet or clean your home. Make a plan and practice it. Never drive through flooded areas. Stay up to date on warnings and news with NOAA. Heed warnings and seek shelter or evacuation straight away if prompted. Prepare a go-bag for everyone in your household, including your pet. Plan now so no one gets left behind. Move livestock to higher ground sooner rather than later. Prepare one gallon of drinking water per person per day. Never ration water for drinking. Dehydration kills. Stay indoors during lightning storms, and consider purchasing surge protectors and lightning rods for your home. Turn off propane to reduce the risk of fire. Use flood prevention walls or bags to keep damage to a minimum.